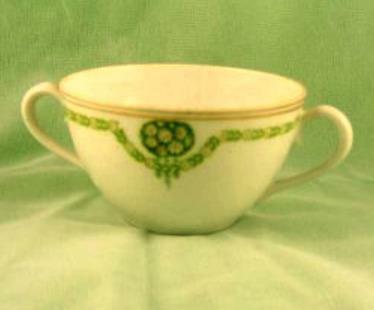 Welmar double handled soup cup. Antique Welmar china is collectible porcelain that was imported from Germany. This type of china is commonly bought and sold in America today. Welmar china, also called Weimar china is a product of the C&E Carstens Porcelain Factory in Blankenhain, Thuringia, Germany. The German porcelain factory has over a 200 year history that dates back to the year 1790. Catherine the Great had commissioned Christian Andreas Speck to create porcelain for her. The company's legacy started with Speck and has continued to evolve into what it is today. The German manufacturer of porcelain had gained noteworthy recognition for their products during the earlier Art Nouveau period, largely due to artisan Alois Hampel. At the world exhibition in St. Louis in 1904, the factory was awarded the Grand Prix. A silver medal was won at the exhibition in Milan Italy in 1906 and a gold medal at the exhibition in Liberec (Czech Republic).The stamp that appears on Welmar china is a stripped shield with a crown over it and two tree branches on either side. The word "Weimar" appears diagonally across the shield. In some versions the words "Weimar Porzellan" and "Made in Germany" also appear. The stamp has been through many variations and colors including green, blue, gold and black, the colors currently used. This German porcelain company still produces about 100,000 pieces of china today. Besides its long, rich history, what makes antique Welmar china so unique? Welmar china is a type of porcelain known as bone china. This type of porcelain gets its name from one of the main ingredients used to make it, which is literally animal bones. Cattle bones that have a lower iron content are crushed and then degelatinised. The bones are then calcined (heated to change the composition) at up to 1250 degrees Celsius, to produce bone ash, which makes up about 50% of the material in bone china. Other materials used in the process include kaolin and Cornish stone. The raw materials to make bone china are expensive and the process is a lot of work. Bone china has an extremely bright white color, greater translucency and superior strength when compared to other types of porcelain. This is why bone china commands high prices and is considered a luxury item. Not only does Welmar china contain quality materials, this award-winning porcelain has a long history of superior craftsmanship. You might think that collecting this type of china, especially if it's antique, would be really expensive. While it certainly can be, you can also collect antique Welmar china one or two pieces at a time. When you buy this way, it becomes more affordable. These sites have all had or currently have antique or vintage Welmar china for sale. Browse through as many listings as you can find and start a journal (or print screen and save web shots of listings) to keep records of what different porcelain pieces are selling for. Over time, you will know when you see a bargain for this type of china.LoveToKnow would like to thank Lauren Carruthers & Susan Janerico of Daphne and Dude Antiques for their permission to use the image of the Welmar soup cup shown above.